Treat yourself and that special someone to a luxury lodge set amongst beautiful rainforest. Enjoy total privacy and relax with a warm spa bath or a wine by the fire. If a day of indulging and beauty treatments leaves you a little too relaxed, rest your pampered head on your own double hammocks. Celebrity treatment continues as you can arrange a chauffer to take you on a winery tour scenic drive, or drop you to a romantic picnic in the woods! Hidden Valley Eco Spa Lodge offers private luxurious lodges for you to unwind and relax. Perfect for 2, guests are treated like stars, with candles, fireplace, spa bath and private courtyard. 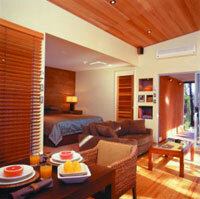 Close to wineries, markets, restaurants and cafes, your stay will be indulgent from start to finish. Hidden Valley Eco Spa Lodges offers your intimacy and luxury with private lodges and amazing spa and health treatments. Let the staff treat you to quality treatment and esteemed service and soak in everthing Hidden Valley has to offer. Hidden Valley is located approximately 25 minutes from the Margaret River township, follow the Bussell highway heading north for Busselton. Turn left into Chambers Road (just past the protea flower farm) following the blue directional signs, then left again into Haag Road. If coming from the Busselton direction, follow the signs for Margaret River onto the Bussell Highway. About three kilometres past Wildwood Road, turn right into Chambers Road and then left into Haag Road. We are located approximately 1.7 kilometres down Haag Road. Accommodation: Cancellations less than one month prior to stay will incur loss of deposit. Cancellations less than two weeks prior to stay will incur total loss of full payment. Cancellations made within 60 days prior to a public holiday long weekend will incur in loss of full payment. Any cancellation will incur a cost of $50. 24 hours notice for Spa treatments and 48 hours notice for Chef or full payment will be taken. Situated overlooking your own personal crystal water lake with a timber jetty & a private outdoor spa surrounded by candles. Enjoy some local wines infront of your indoor log fire. Secluded in the forest with trees growing up through the decks, there is a wall of glass looking out into the forest which lights up at night. Including a European style kitchen, gas bbq, king sized bed, log fire, reverse cycle air conditioning, television, CD player, dvd player and candles throughout. The most affordable accommodation that the Hidden Valley has to offer is the Stone Stable Cottage. This picturesque rustic cottage offers a private Balinese style courtyard, outdoor spa and a semi-self contained kitchen. Perfect for that romantic getaway when nobody is to know where you are and you are spending time for each other. Architectural retreat that embodies a sophisticated Australian style in a pristine environment surrounded by protected forests. Secluded and perfect for a romantic retreat the Wilderness Cabin offers and outdoor spa hut surrounded by candles, king sized bed and stylish kitchen.